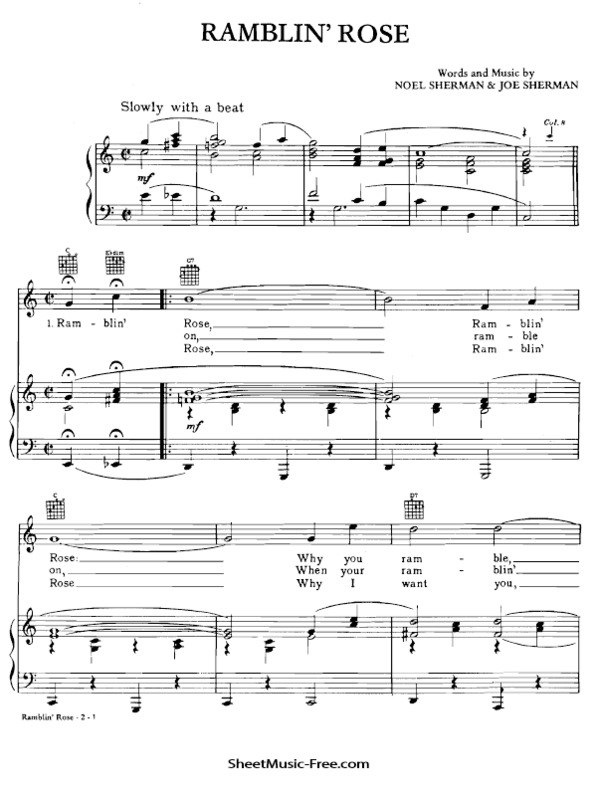 “Ramblin Rose Sheet Music” by Nat King Cole, “ Ramblin Rose Sheet Music” for Piano / Vocal/ Guitar Chords , Original key: C Major, number of pages sheet music PDF: 2, Video and Lyrics song Ramblin Rose Sheet Music. “Ramblin Rose’” is a 1962 popular song written by brothers Noel Sherman and Joe Sherman and popularized by Nat King Cole. Ramblin Rose Sheet Music Nat King Cole. The song has been covered by many artists, particularly country music artists. There are four country versions of the song. Sonny James recorded the song first in July 1968 and released it five years later on the album The Gentleman from the South in 1973. Johnny Lee’s version reached number 37 on the Billboard country chart in 1977.The following year, singer Hank Snow’s version charted at number 93. In 1978, Johnny Rodriguez released a cover of the song on the album Love Me with All Your Heart. Petula Clark released a French version in 1962, titled “Les Beaux Jours“. Her recording reached #10 in the French charts in 1963. Others recording this version of the song were Charley Pride 1962, Roy Rogers 1962, Billy Vaughn, Louis Armstrong, Bobby Vinton, Engelbert Humperdinck, Paul Anka, Floyd Cramer, Elvis Presley (home recording), Chuck Berry 1967, George Benson, the Mills Brothers, Dean Martin 1973, Marvin Gaye 1976, and Slim Whitman. There is a different song called “Ramblin’ Rose,” recorded by Jerry Lee Lewis and MC5 in the 1960s; although it has the same title it is a different song, written by Wilkin and Burch, and not to be confused with the Nat King Cole hit. Neither of those songs should be confused with “Rambling Rose,” a light pop song from the 1940s, with music by Joseph Burke and lyrics by Joseph Allan McCarthy Jr. It has been recorded by a number of singers, most notably Perry Como.